However there was no magic to it. 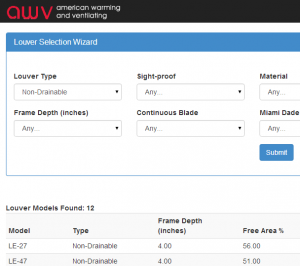 I created a Louver Selection Wizard for American Warming and Ventilating. I’ve written in prior posts about using PHP, CSS, and the Bootstrap Framework. (Ship It – By My Bootstraps) While this site isn’t nearly as heavy with the PHP programming as the Specification Writer from the Ship It post, working with Bootstrap was a really great experience. The application looks nice and modern and mobilizes great onto smaller screens. Next I would really like to learn AJAX so that the search results could update without refreshing the whole page, or even refresh as changes are being made to the form. I would also like to go back to some of the other applications I’ve done and add the Bootstrap CSS to make them look better and mobilize in an intentional way. I may also go back in and add a few more fun Bootstrap CSS touches. One example of what I mean is when a louver is in the search results that has vertical blades, I have a V with a black background using the <kbd> tag with a title. This really draws attention to the V and the title gives it a mouse over with an explanation. I thinks that’s a cool touch and would like to do more like that. I am trying to be somewhat disciplined and not start working on my Weekend Project until other current project is finished. It’s always tempting to start a new cool looking project. But instead of having a bunch of unfinished projects I’m using the desire to start working on that Drawdio to motivate me to finish this PHP and web design project. Don’t get me wrong, my current PHP / web design project is pretty cool too, just in a different way. I’m using the Bootstrap framework to build a web application that will hopefully look very modern and scale well to any screen size. I really like this framework because it comes with so many CSS styles to use. Setting up those styles and choosing what looks good together has always been the hardest part for me, this makes it much easier. Check out the examples on the Getting Started page to get a quick idea of what a Bootstrap design looks like. I still have quite a bit of leaning to do so that I can get away from my table based layouts of the past. The CSS included with the Bootstrap framework and all of the examples given on the site will really help. Everyone building web sites and applications should be familiar with Bootstrap. In his manifesto How To Be Legendary author Johnny B. Truant gives “The surefire formula to become Legendary”. Step 2 is simply “Ship”. At least for me, when I don’t have a specific deadline, this can be the most challenging step. When is something totally done? Could it ever be truly perfect? Well I’ve taken Johnny’s advice/instruction to heart and shipped my first PHP programming project. I’ve written a Section 089000 3-Part Louver Specification Writer. This was a really interesting project for me. I used some CSS for expanding and collapsing sections that I’d never used before, of course the application is written in PHP which is still new to me, and it outputs a file in Rich Text Format (.rtf). The syntax of the RTF file may have ended up being the most challenging part. This web application may not be terribly interesting if you aren’t an architect needing to specify a louver. However I still think it’s kind of cool. The application builds the correctly formatted text based on the options selected then outputs that text in RTF. I’m sure I could have spent several more weeks adding more features and tweaks. But I’m glad that decided to ship this web application and will be able to start on another project. So, tomorrow makes 1 year ago that I graduated. I already mentioned that I’ve been learning PHP this year. I’m also trying to teach myself how to play guitar, we finished our basement at home, and I’ve done a bunch of reading. In my prior post I linked to the phpacademy site which is the primary resource for learning PHP. My first PHP project is mostly finished. It has been a good experience. I’ve not only learned the PHP language, but also the RTF file specification as the application outputs an RTF file. Since graduation I decided that I needed a hobby, so I chose to start learning guitar. My main sources of instruction for this endeavor are Marty Schawtz’s youtube channel and justinguitar.com. Due to all of the other items on this list, I haven’t had the time to learn and practice that I would like. I can play a couple of simple songs and chords. I hope to have much more time for this in 2013. One big reason I haven’t done more on the guitar is that I was working on finishing my basement during much of the same time. This was my first attempt at many of the tasks including laying the carpet on the floor and stairs. I did a lot of youtube browsing to learn about wiring and electrical outlet and carpeting stairs. Reading I started out the year reading the Furies of Calderon which is the first book in the Codex Alera series by Jim Butcher. It is a fantasy series along the lines of the Lord of the Rings. If you are not into fantasy, this may not be your cup of tea. I’m currently reading the 5th book in this 6 book series and have really enjoyed it. A book I think anyone would really like is Wool (pictured at right). I specifically read Wool Omnibus Edition (Wool 1 – 5) on my Kindle. It is a great story and I look forward to reading the prequels and sequels. I’ve already recommended this book to several people. They will thank me later, and so will you! Finally I want to put a plug in for Trello. Trello is the new web application we are using here in the office to manage our tasks and projects. I really like the visual style of Trello and the drag-and-drop interface. The video below does a good job of explaining how Trello works. I don’t know why they don’t have it on their web site anymore. So I’ve decided that it’s time to move beyond ASP classic for web programming. I am working on teaching myself PHP. I’ve chosen to learn PHP because that is the language we use for our applications in the office and I find the code fairly easy to read. I’ve been using Notepad++ as a text editor for several years and find that it is also very good for writing PHP code. If you set the language as PHP from the beginning it will do contextual highlighting for you which is very nice. My main resources for leaning the language are the phpacademy and php.net web sites. The phpacademy site links to over 500 video tutorials on PHP programming. Each video is fairly short and does a good job of explaining a given function or construct. I mainly use the php.net site to get the syntax for functions. The code examples that others leave in the comments can be helpful too. And of course there is the MySQL reference manual if that is your database of choice.